Giving you the freedom to choose. MRI. CT. 3D/4D Ultrasound. Bone Densitometry. Digital Mammography. General X-Ray. Thank you for your interest in Corridor Radiology. We’re conveniently located in the new and expansive Coral West Health Center, one of Iowa’s largest health-focused communities. We’re proud to give the Corridor, Iowa City and Cedar Rapids patients the freedom to choose when and where their diagnostic imaging services are performed. 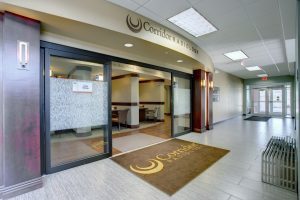 Corridor Radiology of Iowa City, Coralville, and Cedar Rapids provides both state-of-the-art imaging equipment and an ongoing commitment to patient comfort and care. Corridor Radiology employs a team of fellowship trained, board certified physicians, professional technologists and friendly, helpful staff. We’re here to meet your imaging needs. With the skill and integrity of Iowa City’s medical community as their background, our physicians are regarded as highly for their medical expertise as they are for their warm and caring demeanor. Their abilities to help patients are second only to their experience to see detailed views from within. Our team of radiologists provides a high level of expertise in such sub-specialties as body, musculoskeletal, breast imaging, neuroradiology, diagnostic and interventional radiology. This means that patients no longer have to travel to larger cities to receive the same level of radiologic care. Corridor Radiology offers convenient, online scheduling and prompt, reliable results within one to two hours of your visit. Free parking, freshly brewed coffee and a beautiful and relaxing reception space greet patients of all ages at our state-of-the art, new facility. Corridor Radiology: serving Iowa City, Coralville and Cedar Rapids patients.